On Monday we did the exact same workout that I did on my very first CrossFit class six weeks ago. So it was a nice way for me to measure some progress. It was Fran (21-15-9 thrusters/pullups) and during the first class I did it in 10m13 seconds with 10kg on the thrusters and using the black band for the pull ups. After six weeks I was able to do it in 8m08 seconds with 5kg more on the thrusters. Still using the black band though. But still, I managed to bring my time down with 2 minutes while adding some weight. So I´m happy :). Last saturday we had an awesome WOD at the box. Normally saturday mornings are at the beach, but for some reason it wasn´t possible this week. I was a bit disappointed at first, because I love the workouts on the beach, but this was sooooo coool. Rich has just bought some new toys for the box and that includes two huge tires. 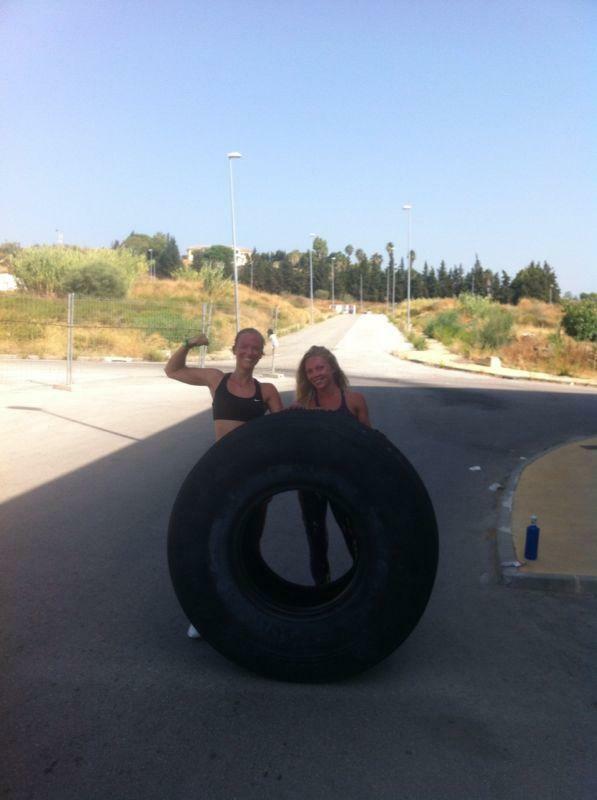 So part of the workout was flipping tires :D.
So that was 45 clean & jerks each, 10 runs each and the tire flips we just did however it worked out. Which worked out in me and one other teammate doing 2 and the guys doing 5 and all four us doing the remaining 1 together. The hill run was basically running up a hill and then jogging/walking back down. The clean & jerks I did with 8kg. Here are some pictures of the morning. It was so cool!! The med ball was not allowed to touch the ground after start, so one of the pair had to hold the ball at all times. There was a 25 minute time cap and Mirella did really good for her first WOD. She finished the wall balls and sit ups and did up to 16 burpees I think. I finished the wall balls and sit ups too and got up to 65 burpees. Before that workout we had to do 7 minutes of alternating Turkish Get Ups. Yes, that is an exercise. They are quite heavy! But I liked doing them. I think I did 3 on each side, so 6 total (with 8kg kettlebell). The exercise looks like this. Before Thursday I hadn´t been to the box for a week!! :O I don´t know what happened, but lets say life got in the way :p.
This week I´m not going 4 times as I wanted to do either. I think maybe I should stick with 3 times a week. Not because I don´t want to go more often, but more because I just don´t really want to make the time for it. It gets in the way of other fun stuff (plus some much needed relaxing time) too much. Anyway.. we´ll see. I´ll go 4 times if I can and try to stick with at least 3 times a week no matter what. On another note. I signed up for a run next Sunday! It´s a 10km run for a good cause. I´ve never run 10km in my life before so that´s going to be a challenge. I haven´t been running at all since I moved to this area so I´m a little out of practise too. And it´s going to be hot. It starts at 10am on the Marbella paseo and you get 1.5 hour to finish. I hope I make it!! Whupsie. I haven´t been updating properly. Last week was a tough week for me. 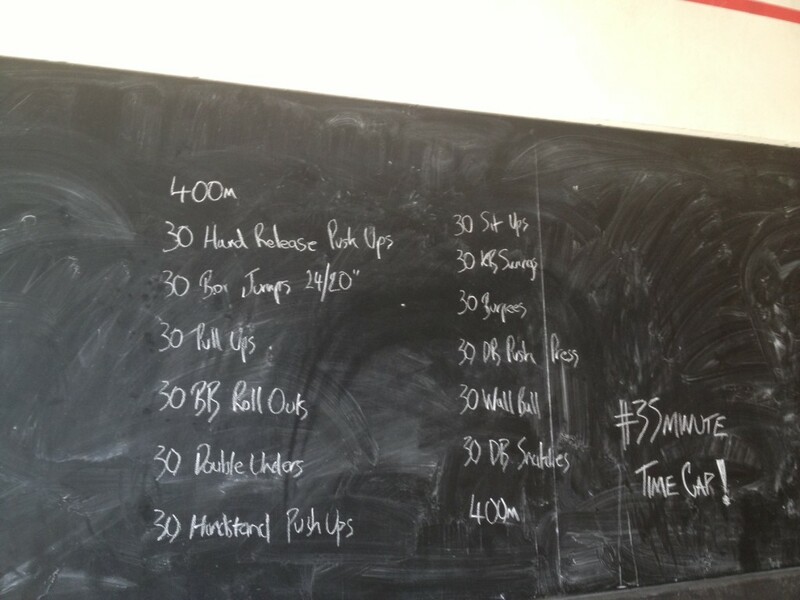 The WOD on Thursday (August 8) was again really hard for me. I struggled a lot last week.. not sure why. This week is going better though :). But lets go back to Thursday. The WOD was like this. It´s a “hero” WOD. We had a 40 minute time cap and I made it through .. wait.. I don´t remember!! I do remember that I only did 5 thrusters each time and that I did them (and the deadlifts) with 24.2kg (5kg less than the Rx). The first round I did 10 deadlifts, but changed that to 5 as well from the second round on. For me those (heavy) lifts are still very new to me and I don´t want to overdo it and hurt my back or something. I think I did 3.5 rounds.. not 100% sure, but yea I think so. Then, the beach WOD on Saturday. That one was really fun and hard. But fun. The WOD was run from one point to another (on soft sand) at about 30m distance. When there do 10 pushups and 10 squats. Run back and do 10 kb swings (8kg) and 10 burpees. Then run to the sea and go in up to your middle. Run back out to first point. That is one round and we had to do 10. When everyone was long finished it was me and another Dutch guy that still had to do two full rounds. I don´t know how they can be so fast!!! They must be cheating :p.
After the WOD we went out for breakfast with some. They have been doing that for a few weeks now. When I used to come with Luke I couldn´t go as I had to drive him back to Calahonda, but now I can join :). And it´s the best breakfast ever! It´s at a place called Pan y Mermelada in Marbella and I don´t know how their breakfasts normally are, but they have a special “CrossFit” breakfast, which basically means you can get anything and everything for €12. Sandwiches, veggies, fruit salades, fruit juices, coffee, pancakes, bacon, more fruit, more veggies, more yummies. It´s delicioso! 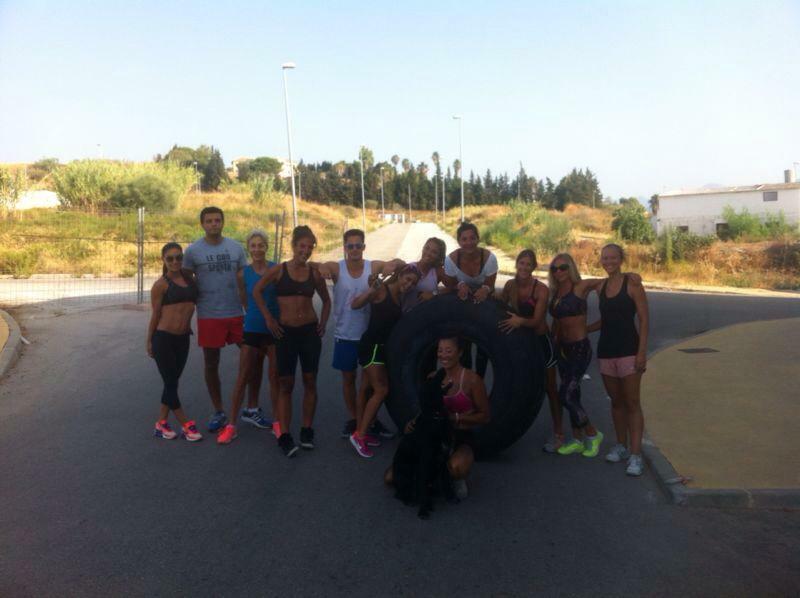 Anyway, back to the WOD´s. This week I started going on Monday as well. On Monday the WOD was like this. The squats I worked up from 20kg to in the last three rounds 43kg. I kind of last my form in the last round though.. didn´t go all the way down with my squat. I was afraid I wouldn´t be able to get back up again!! I think I can do heavier though.. If I don´t have to do 6 reps :p. Should try it next time. The walking lunches I did with 2kb swings of 8kg. After that it was 3 rounds for time of kb swings and runs. (More running!!! GRRRR!!) I wanted to take the 8kg kettlebell again, but they convinced me to take 12kg. Which, when trying out, I had a hard time with from the first go. Butttt, I did manage!! In the end I did 90 kb swings of 12kg and 3 400m runs in 14:58 minutes! It felt awesome!! When you see this on the wall you know it´s time to be scared! He called it the Tamburello. As Luke Tamburello (one of the box members) turned 30 yesterday. Hah! Let´s hope nobody turnes 40, 50 or 60 soon ;). In 35 minutes I got up to 18 wall balls. I did real push ups (instead of from the knees) for the first time in a WOD and made it through all 30 almost in one go :D. Box jumps I did 20″. Pull ups with black band. I found the roll outs really hard. You´re supposed to roll out all the way to a vertical position, but I can´t come back up when I try that. So I just go about halfway and pull back. Double unders I don´t know how to do yet (they´re rope jumps where you jump once but the rope goes under twice) so I did 60 single jumps instead. And I did all of them in one go as well, which made me happy. The handstand pushups I did from a box. Basically you put your toes on the box and make sure your body is in 90 degrees so your upper body is straight up in the air and your legs are vertical. Then try and push up. Looks easy. Is not easy. Sit ups were a piece of cookie (because a cookie is so much nicer than cake). The kb swings I did with 8kg (yah I know I should have taken the 12kg but trust me after doing all those other things my arms were already like jelly). Then the friggin burpees, which always make me dizzy. The push press is something I had never done before. I did them with 2 kettle bells of 8kg. It was quite heavy!! I had to do reps of 5 so I spent a lot of time on it. There was 1 minute left on the clock when I started the wall balls. I used a 10lbs ball and got 18 in there when the time was up. It was a very nice workout!! Today I´m feeling it though. Happy that I have a rest day ;). Tomorrow I´m going again. Today it´s one month since I started. I made some pics on the first day and some this morning as well. Maybe I´ll post a comparison picture later. Although I don´t think there is much difference to be seen yet. I wanted to post something about my food habits as well. But don´t have time!! Will try and update soon!